Luxy Hair is a free Windows 8 Hairstyle app that brings to you a huge collection of amazing hair-styles to groom yourself on different occasions and moods. With this app, you can learn many lovely and glamour hairstyles to get that celebrity look. This free Windows 8 Hairstyle app offers video tutorials on different types of hairstyles for women such as braids, buns, curls, waves, and many more. Not just this, you also get other useful hair-care tips to make your hair smoother, silkier, and healthier than ever before. Luxy Hair is freely available in the Entertainment section of Windows Store. You can view the app directly in Windows Store by clicking on the link given below at the end. 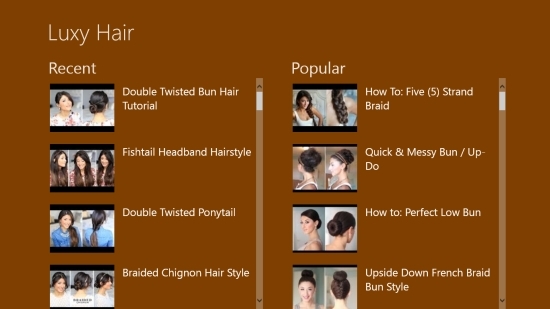 Let’s have a detailed look at this very interesting free Windows 8 Hairstyle app. To access video from this Free Windows 8 Hairstyle app, all you need to have is just this app installed on your Windows 8 system and an active internet connection. The app’s interface is quite simple that contains a huge collection of hairstyle video tutorials. The Main screen looks simple and is broadly divided into two categories: Recent and Popular. Each category tables a number of hairstyles of different types, displaying the pictures and names of hairstyles. Click on any hairstyle that you wish to see and learn. The next screen will display video tutorial of the selected hairstyle. Sometimes, the video might take a little time to load depending on the speed of your internet connection. You will see icons for volume and full-screen mode below the video. These options can be used to adjust volume or play a video in full-screen mode. Use back arrow button on the top left corner of the screen to go back to the main menu. Video tutorials on different types of braids, buns, curls, waves, etc. Also check Nail Art Designs and Hair Braiding app. Luxy Hair is an awesome app that features a wonderful collection of different types of hairstyles and hair-care tips for women. Having this app means you won’t need to spend money and time with a hair-stylist any more. 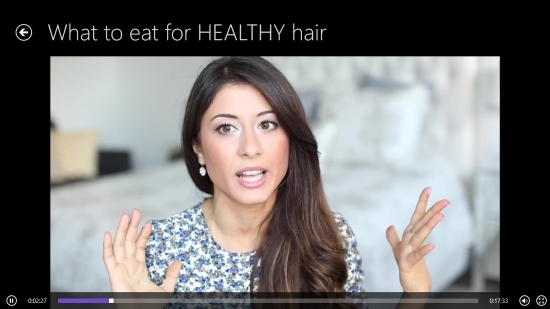 Rather, you can learn these hairstyles easily through video tutorials and try them at home. Try this app now and get ready to flaunt with these amazing hairstyles. Do share your feedback via comments.